Southern Utah University is advancing its aviation program with the purchase of ten new planes from Cirrus Aircraft expected to begin arriving in June. The fleet of Thunderbird-red, fixed-wing planes features the Cirrus SR20 - a technologically advanced, easy-to-fly modern training platform that will prepare both flight instructors and students to fly tomorrow’s commercial airliners, military and general aviation aircraft. 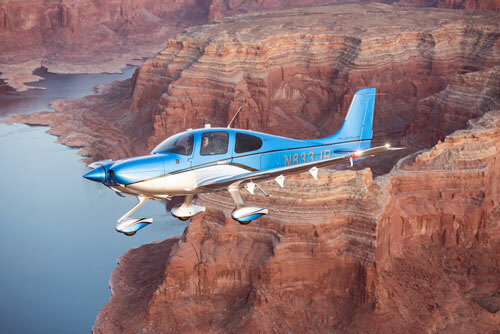 The SR20 offers a durable airframe designed to handle rigorous training programs and is the only single-engine plane to come equipped with the life-saving Cirrus Airframe Parachute System (CAPS) as standard equipment. Designed to lower the airplane safely to the ground in the event of an emergency, CAPS is revolutionary to airplane safety. In its class, the SR20 also features the latest in cockpit technologies, maximum cabin size and visibility, and instrument training systems designed to prepare students for flying more advanced aircraft. According to SUU chief fixed-wing flight instructor Neal Donahue, the university’s aviation program is poised for growth. SUU’s fixed-wing program expects a 300 percent increase by fall semester, 2017. The recent announcement of a partnership with SkyWest has vitalized enrollment. “With a SkyWest mentor specifically assigned to SUU students, we are beginning to see our students moving into professional pilot careers and it’s very exciting,” said Donahue. The strategic partnership between SUU and SkyWest is designed to leverage the unique resources of each entity with the goal of creating industry-leading career options for prospective pilots. For SUU students entering the Pilot Pathway Program, SkyWest Airlines provides tuition reimbursement and other resources to guide students on their way to beginning careers as SkyWest Airlines first officers. Due to arrive June 3 are the fleet’s first four planes, followed by three in July, and three in August. For more information about SUU Aviation, or to inquire about the SkyWest Pilot Pathway Program, contact (435) 586-7862.